In the last post I mentioned some of the work done by Network for Languages London. Let’s have a look this week at the work by Routes into Languages. Have a look at the different regions and what they are offering. There are many events across the country, motivating competitions that students can enter and awards they can aim at. The Gold Award, for example, was developed by the Routes into Languages South East Consortium. There is currently a rollout of the award to the Yorkshire and the Humber region. Here is a link to an example, the Personal challenge. Funding is scarce, but there is some. Look at the example of Wales. Ani Saunders is the Routes Cymru Project Manager and Coordinator and speaks about funding and collaboration. In my experience colleagues at universities are very willing to work collaboratively. René Koglbauer at Newcastle University, our new ALL President and I worked have very successfully together using video conferencing equipment at the university and linking this to the classroom to improve sixth formers’ speaking skills, which was very cost effective. We went on to plan Y12 study days at the university. This did involve transport costs of course but all the sixth formers agreed at the end of the day that it was worth the money! We decided then to try to improve take up at A level we would focus on Y10 and Y11 groups and have run several days for GCSE students in the North East too. Only time will tell if the numbers at A level increase. We hope so. It is a concern that due to budget constraints there are fewer and fewer FLAs being employed and many schools will only run courses in the sixth form if there are more than 8 students in the group. Video conferencing is being used successfully across some sixth form at schools and colleges where the numbers studying languages are low. A couple of week ago I mentioned the Migration Museum Project. Their exhibition ‘Germans in Britain’ is being hosted by St John’s College Oxford at the end of November and they are running a series of events for schools to tie in with its time there. They are particularly keen to encourage applications for their Year 12 German Study Day on Friday 28th November, which is an event is for keen A level linguists who are interested in finding out more about studying languages (and German in particular) at Oxford. 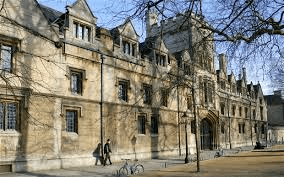 The Oxford degree has a strong literary focus and allows for the study of single languages, as well as combinations including beginner’s level. On the same day they are running a teacher-tutor forum to encourage discussion between secondary and FE modern language teachers and Oxford language tutors. This will be an informal session with refreshments, and is followed by an opportunity for teachers to attend a talk by Dr Angus Nicholls on Max Mueller: “Oxford is most beautiful, but one longs for German Professors”. F. Max Mueller’s Encounters with British Thought and Culture’. There is no doubt that people are working hard to promote languages. Many universities put on events for students, so check the websites of the universities near to you to see what support is there.